Whitefish Dunes State Park in Door County, Wisconsin isn’t about fish, but it is about dunes … sort of. And dogs. There’s a dog beach and that’s – of course – important. First, the dunes at this 867-acre state park are not the rolling hills of deserts you (and me) are likely visualizing when you think of sand dunes. At this state park, it’s hard to tell there are dunes at all because they’re covered with grasses and trees and look like regular hills flanking the Lake Michigan beach. Also, you can’t walk on them. Gone are the days when locals rode dirt bikes up and down the ecologically sensitive area. Second, where people can go … and do… is the beach. Fine lakeside sand extends for miles and regular entry points – breaks between the hills – allow access to an easy-to-navigate trail system. The 2.8 mile Red Trail takes you via packed trails, boardwalks and stairs to Old Baldy, the highest sand dune in the state – about 93 feet above sea level (Note: Wisconsin is kind of flat). Whitefish Dunes is one of the state’s most popular day parks (no camping) and the parking lot attendant keeps track of out-of-state license plates on a map. Usually on an August afternoon, the beach is full of sun seeking families. Yet the day I’m there the air is chill and the water’s temperature has dropped ten degrees overnight. Attendance is sparse and only the dogs venture into the lake. Yes, half the beach (about a mile) is dog friendly, and so is most of the park. People and their pets enter the beach through the Red Trail on top of the dunes. A sign indicates the path that takes you down to the water. Dogs are supposed to be leashed and two are today – but as regulars tell me that’s an exception, not the norm … kind of like today’s weather. The 867-acre park in Sturgeon Bay, Wisconsin is open until 8pm each day year round. There’s a new nature interpretive centre with full bathrooms at the park’s entrance. A candlelight cross-country ski event takes place in January, and a similar summer walk in June annually. The park’s outdoor shipwreck museum features pieces of 100-year-old shipwrecks saving visitors the effort of scuba diving to see them. Before the building of the canal that links Green Bay to Lake Michigan, ships had to navigate north around the precarious peninsula – dubbed ‘death’s door’ – thus leading to Door County’s name. Check out an earlier post about Sea Dogs, a celebration of clever marine canines and The Chicago Fireboat, also in Sturgeon Bay. If you want to have dinner with your dog in Door County, you can do that too at Harbour Fish Market & Grill. MORE INFORMATION: For a complete travel guide to this dog-friendly outdoorsy state check out Moon Wisconsin travel guide. Love the beach! This sounds like a wonderful place! I enjoyed being an armchair traveler with your great post! I love a good dog beach, I think with the wide open space, loose dogs are usually able to get their energy out, so they’re typically all gentle and relaxed when they meet Matilda. It’s so fun to see them swim and dig on the beach! I’m with you – off leash is necessary. On leash only beaches just don’t work. Sounds like a wonderful place to visit. Interesting that you can’t tell the dunes are really dunes….but who cares when there’s a beach and Lake Michigan?! Yea, they are kind of grassy hills. I wouldn’t have known if someone didn’t tell me. This sounds like a gorgeous place to visit! It would be neat to see the pieces of the shipwrecked ship. I enjoy historical things like that. I have seen the sand dunes on Michigan’s side of Lake Michigan, but I’ve never been to Wisconsin. I hadn’t been to Wisconsin before either and didn’t have any plans to go. But I’m glad I did, kind of spontaneously. That looks gorgeous! 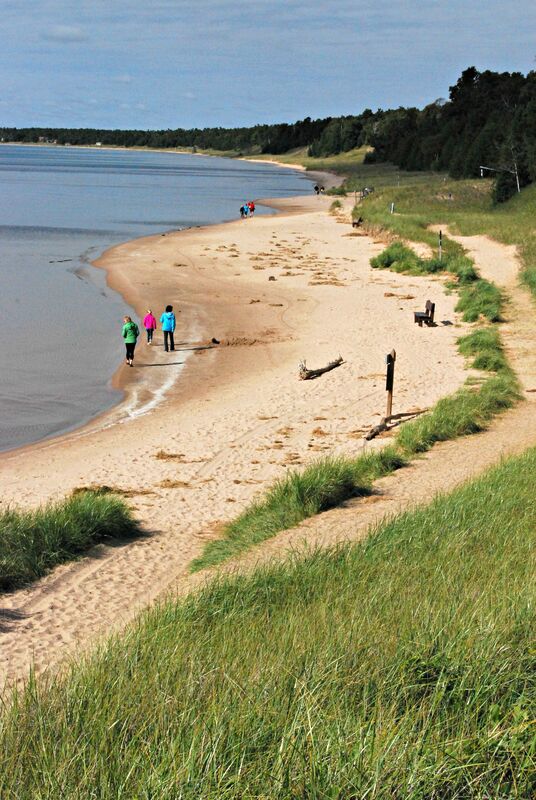 Being from the southeast (VA), I have a hard time imagining beaches on the Great Lakes, so I appreciate the photos. I’d LOVE to go to one someday. It’s true. Lake beaches aren’t the same. But when it’s all ya got you pretend there’s a tide. I used to go to state parks all the time when I was younger, especially the ones located near the beach. Haven’t met a state park I don’t like. We always love learning about places we can travel (by car) with the dogs. 867 acres? Wow, that would be a good night’s sleep! I would LOVE to take my guys for a train ride. Sounds like a wonderful place to visit! Like you, I’m always happy to see other’s people’s dogs. 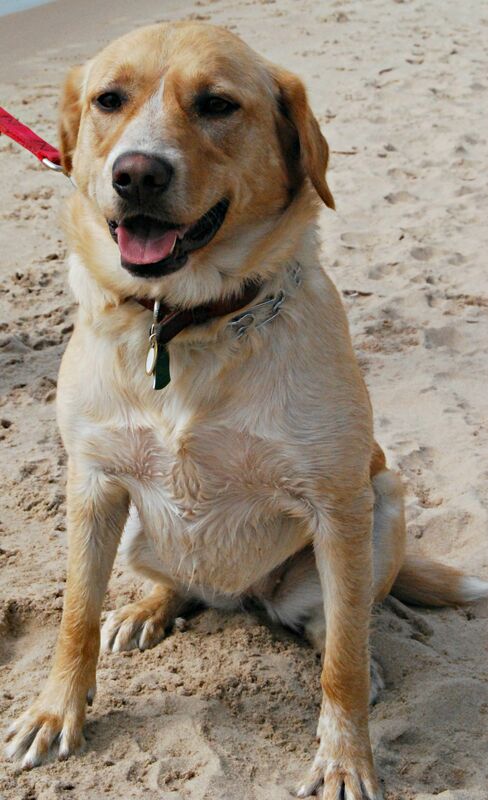 There is just something about a dog on a beach that makes me smile! My dog’s best friend is part lab and she ‘rides the waves’ Loves the water. Oregon has some pretty awesome parks that are dog friendly but you all have actual beaches to swim on – and 867 acres! I’m super jealous as this looks like paradise for dog owners. Awesome post! Thanks. There were dogs throughout the park – more than kids but it might have been the day of the week I was there. We have never carried the dogs to a beach but this sounds fabulous! Yes this one is a little odd because you have to walk with the dogs on the trails behind the beach then walk down a path marked ‘dog beach’ entrance to get the dogs there. Wow, that sounds like an awesome place to visit. Did you drive there? Looks like it would be about 10 hours from Toronto? Wish we had more than one or two dog friendly restaurants and cafes in Ontario. No I flew from Buffalo but with two flights there was not much time saved. I didn’t have Vic with me (I was on a Press trip) so I had to take photos of other people’s dogs. But there were so many places you could take dogs like outdoor patios and even outdoor theatre that many people travel there with dogs. It looks like a lovely beach for a run! I bet dogs love it! I remember a trip to Door County years and years ago with our two Corgis and it was beautiful! This beach sounds like a great place to go if dogs like the water! I’m surprised how many people have been. It was all new to me. Whitefish Dunes sounds like an amazing place! Someday, I would love to see in person! Looks like and awesome place for dog outings. Door County is a wonderful place! We live in the Chicago area so it’s not too far from us. 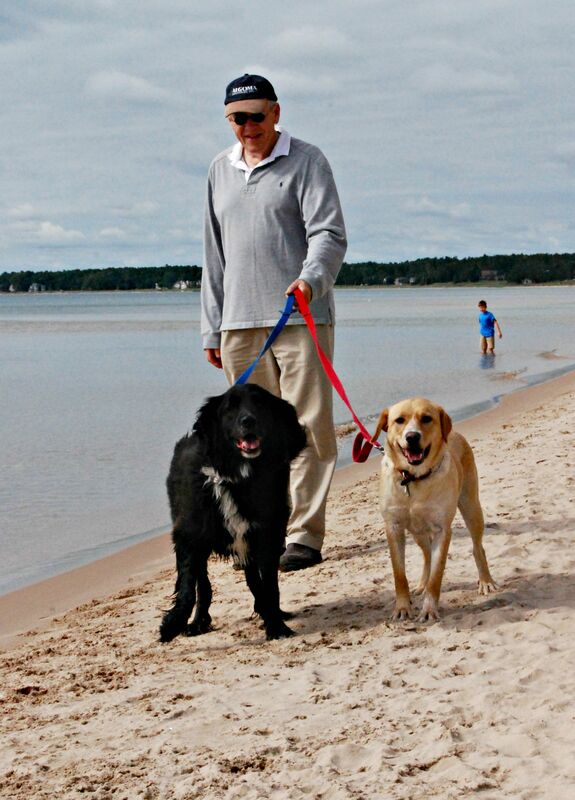 I have been to Whitefish Dunes several times, but haven’t brought my dogs – will have to do that next time. I didn’t realize Chicago was that close. It felt like Door County was far away maybe because it took two flights to get there from the Buffalo airport. This place sounds awesome! I’d want to visit the museum. It’s nice that part of the beach is dog-friendly. Most of Oregon’s beaches are but I think we’re the exception compared to the rest of the country. Other than being chill, it was an ideal beach. The shipwreck museum is interesting – the most interesting pieces are outside so the dog gets to walk around too. Whitefish Dunes sounds like a great day adventure. I love it when places are dog friendly! Me too…. even if I don’t have a dog with me. I’d rather meet dogs than… well, you know.